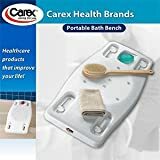 North Coast Medical NC28954 Carex Portable Shower Bench 31 in. x 14 1/4 in. Convenient one-piece bench for the bathtub.Features. This Portable Bath Bench is ideal for persons with restricted mobility.. Quality Carex construction and design.. Compact size is convenient for travel and storage.. Rubber stops hold the bench in place firmly without scratching the surface of the bathtub.. Measures 31 x 14.25 in. 79 x 36 cm.. Fits standard bathtubs from 19 to 28 in.48 to 71 cm wide.. Supports up to 300 lbs. 136 kg.. Cannot be used over shower door railings.. Dimension - 2.3 H x 15.8 W x 31.5 D in.. Item Weight - 5.65 lbs. Convenient one piece bath bench has a comfortable contoured seating area. Easily adjustable in width, fits standard bathtubs 19-28" wide.